van der Waals (vdW) materials consist of individual atomic planes bonded by weak vdW attraction. These material display nearly all electronic and optical phenomena found in solids, including plasmonic oscillations of free electrons characteristic of metals, light emission/lasing and excitons encountered in semiconductors, and intense phonon resonances typical of insulators. 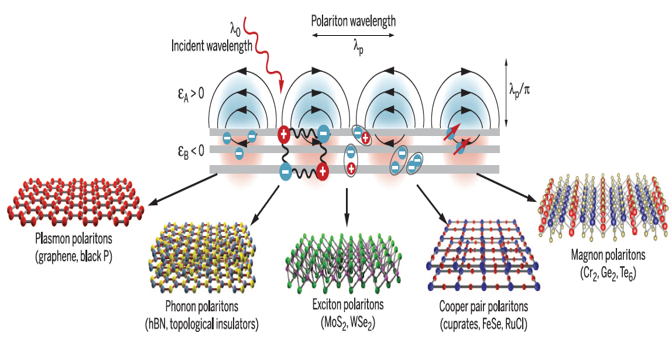 These phenomena are embodied in confined light-matter hybrid modes termed polaritons—excitations of polarizable media, which are classified according to the origin of the polarization. The most studied varieties are plasmon, phonon, and exciton polaritons. In vdW materials, polaritons exhibit extraordinary properties that are directly affected by dimensionality and topology, as revealed by state-of-the-art imaging of polaritonic waves. vdW heterostructures provide unprecedented control over the polaritonic response, enabling new quantum phenomena and nanophotonics applications that we systematically investigate by means of a variety of nano-optical techniques developed in our laboratory. In collaboration with M.Fogler (UCSD). Interfaces of van der Waals materials sustain hybrid light-matter modes involving collective oscillations of polarization charges in matter, hence the term polaritons. Surface plasmon polaritons, supported by electrons in metals, constitute a most-studied prominent example. Yet there are many other varieties of polaritons, including those formed by atomic vibrations in polar insulators, excitons in semiconductors, Cooper pairs in superconductors, and spin resonances in (anti) ferromagnets. Together, they span a broad region of the electromagnetic spectrum, ranging from microwave to ultraviolet wavelengths. Twisted bilayer graphene (TBG) consists of two graphene layers rotated relative to each other and forming a Moire pattern. At small twist angles, atomic reconstruction leads to the formation of periodic domain wall solitons that host topologically protected chiral states. 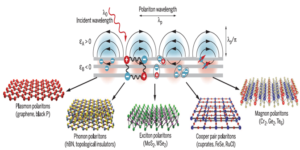 Previous work [Jiang et al, Nano Lett, 17:7080 (2017)] has shown that plasmon polaritons in graphene are efficiently scattered by the domain wall solitons. We used infrared nano-imaging to study the properties of plasmons propagating in small twist angle TBG. We discovered that, the periodic soliton network transforms the TBG into a natural plasmon photonic crystal, where the origin of the plasmon scattering is a purely quantum effect. In addition, we showed that the properties of the TBG based photonic crystal are sensitive to the twist angle, providing a new control knob for tuning plasmons in graphene. 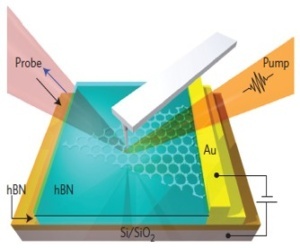 Nano-IR imaging of graphene surface plasmons in layered Au/hBN/G/hBN/SiO2/Si heterostructure at cryogenic temperature. The entire field of view is within the diffraction-limited spot of our IR laser, which operates at an energy of 110 meV. 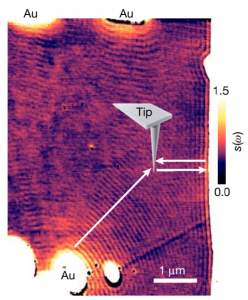 Nano-IR image of plasmonic fringes from the encapsulated graphene monolayer, expressed by the normalized scattering amplitude s acquired at a back-gate voltage of 97 V and a temperature of T = 60 K. The arrows represent the propagation direction of the plasmon waves. These experiments simultaneously visualize the local electric field associated with interference from plasmon polaritons emitted by the near-field probe and reflected by sample edges, as well as from polaritons emitted by the Au microstructures. Graphene is emerging as one of the most capable candidates for plasmonic media for infrared wavelengths. Here we visualize and elucidate the properties of non-equilibrium photo-induced plasmons in a high-mobility graphene monolayer4.We activate plasmons with femtosecond optical pulses in a specimen of graphene that otherwise lacks infrared plasmonic response at equilibrium. In combination with static nano-imaging results on plasmon propagation, our infrared pump–probe nano-spectroscopy investigation reveals new aspects of carrier relaxation in heterostructures based on high-purity graphene. 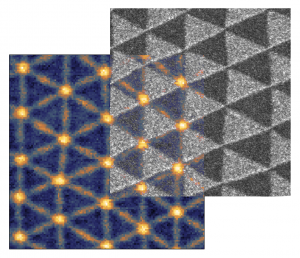 Moiré patterns are superlattice structures that appear when two crystals with a minor lattice mismatch are superimposed. 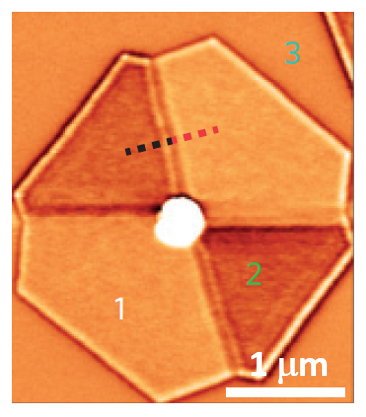 A prominent recent example is that of monolayer graphene placed on a crystal of hexagonal boron nitride. 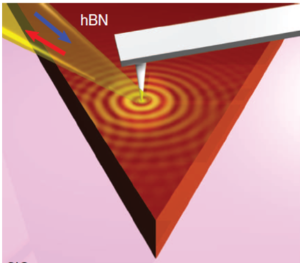 To probe the dynamical response of the moiré graphene, we use infrared (IR) nano-imaging to explore propagation of surface plasmons, collective oscillations of electrons coupled to IR light. We show that interband transitions associated with the superlattice mini-bands in concert with free electrons in the Dirac bands produce two additive contributions to composite IR plasmons in graphene moiré superstructures. van der Waals heterostructures assembled from atomically thin crystalline layers of diverse two-dimensional solids are emerging as a new paradigm in the physics of materials. We used infrared nanoimaging to study the properties of surface phonon polaritons in a representative van der Waals crystal, hexagonal boron nitride. We launched, detected, and imaged the polaritonic waves in real space and altered their wavelength by varying the number of crystal layers in our specimens. The measured dispersion of polaritonic waves was shown to be governed by the crystal thickness according to a scaling law that persists down to a few atomic layers. Our results are likely to hold true in other polar van der Waals crystals and may lead to new unctionalities.